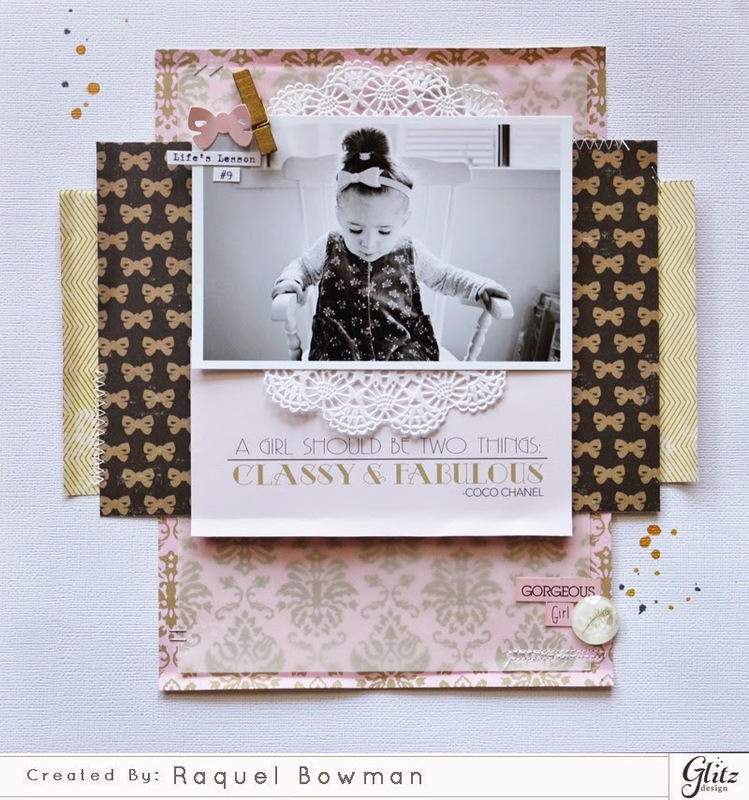 This month the Glitz Design kit features the range 'All Dolled Up'. I had not yet had a play with this collection so I decided to have a play and chose a favourite recent photo of Charlotte to scrap with. On this day I had dressed her up for a visit to her Grandma's. She just looked totally adorable, and a lot bigger than her nearly 2 years old. 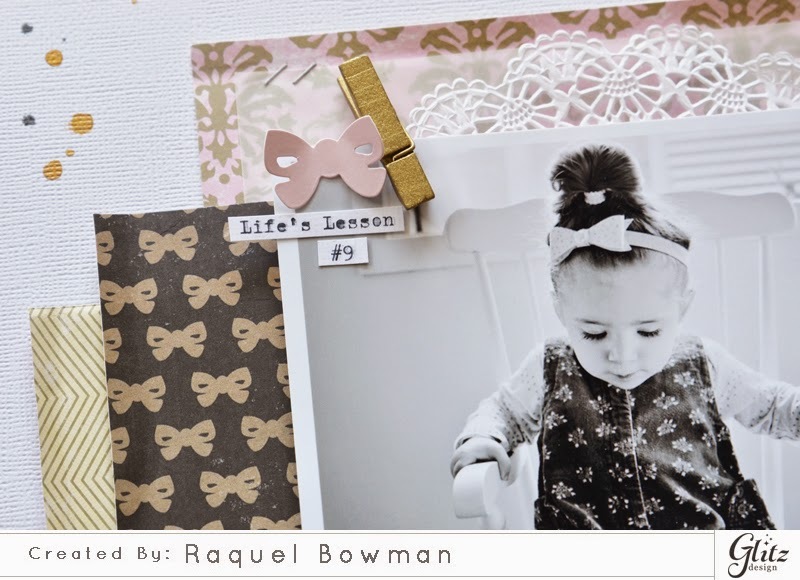 I thought that 4x6 card from the Bits and Pieces paper was a perfect title and it was then I decided this would be another layout for her 'Life's Lessons' album. It was just one of those photos that I had wanted to scrap. 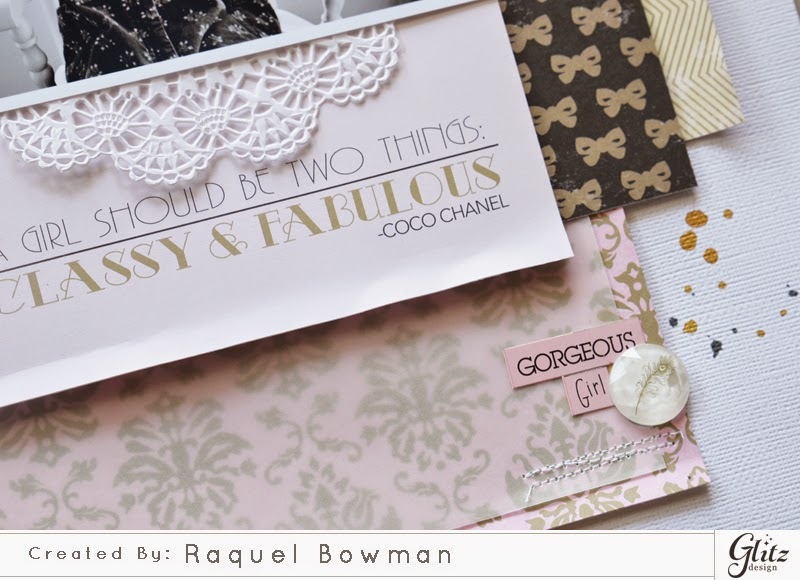 I love the feminine feel of this layout and I think it is achieved by the colourings in the papers as well as the softness added by the vellum and the doily. I kept the layout simple in design, but layered which I think suits the title well too. I do not think a busy page would have worked or achieved quite the same effect. A close up of the title, and the accent stickers and giant rhinestone. The 'gold' droplets were created using the new Tim Holtz distress stain spray in 'Tarnished Brass', it has a really gorgeous golden tone. A layout doesn't seem complete lately without a touch of vellum, a doily and a peg. I recently added to my peg supplies from D-lish Scraps, who now have a large range of colours available. The bow sticker is also from the 'All Dolled Up' collection. Thanks for visiting today, having a great weekend! This is so adorable Raquel - love that title!